I am a collector. A collector of souvenirs. Some of my souvenirs are small, like fridge magnets and those little snowglobes, but I also collect recipe books. A whole load of recipe books. I have the more practical recipe books, like my beloved Delia, but my souvenir books tend to be a little on the odd side for the most part, like my Astronaut Cookbook that I got in Seattle (freeze-dried soup anyone? ), or the one I got at Alcatraz. Sometimes my souvenir books are also practical though, and this recipe comes from one of those, purchased in North Lake Tahoe. I tagged it as one to make as soon as I looked at the book, as it involved those fantastically wonderful California Apricots, and then spotted some early apricots at Milk Pail. And then I added ginger. Standard adaptation in this house. Lightly butter a large cast iron skillet, and place a round of parchment paper on the bottom. Place the skillet on medium heat and melt butter until foamy. Note: I don’t have a cast iron skillet. One of their little asides for this recipe is to use either cast iron or pyrex for even heat distribution. Pyrex + direct heat = recipe for disaster, so I used my pyrex, but instead of placing it on the hob, I placed it in the preheated oven instead. It worked, was just slower. Also, I didn’t have dishes that were very big, so split everything into two. Reduce heat to low, and sprinkle brown sugar and honey evenly, and then cook for 2-3 minutes. 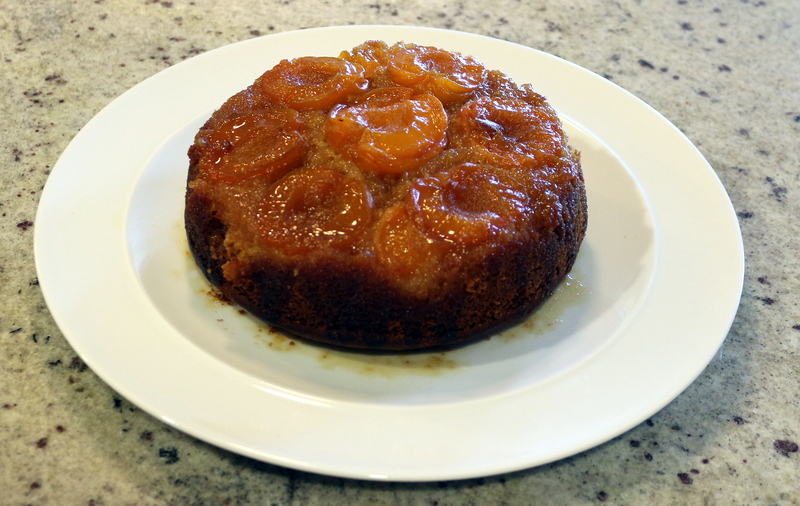 stir gently, and arrange apricot halves, cut sides down, close together on top of the sugar mixture. Remove from heat. Beat together butter, sugar, and extract in a large bowl until pale and fluffy, beat in eggs one at a time until mixture is creamy and doubled in volume, about 2-3 minutes. Reduce mixing speed to low, and add the flour mixture alternately with the buttermilk mixture, mixing until just combined. Gently spoon batter over the apricots and spread evenly. Bake in the middle of the oven until golden brown, and a skewer inserted into the centre comes out cleanly, about 40-45 minutes. Immediately invert the cake onto a large plate, and leave to cool to warm or room temperature. The apricots on the top cook to a jammy type deliciousness, and the ginger I think adds that little something extra. But then I am a ginger fan. In other happenings, I have started a new course on Coursera about epigenetics. More learning! We love the learning really!